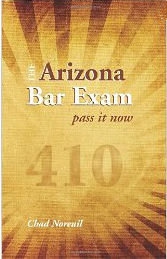 Arizona Bar Exam – Pass it now! This book breaks down every aspect of the Arizona bar exam, including study strategies, approaches to writing effective essays, approaches to scoring well on the MBE, and more. Unlike other current books about passing the bar exam, this one is specific to the Arizona bar exam. Moreover, this book particularly addresses writing strategies and learning theory, both vital requirements for passing the bar exam. If you want to pass the Arizona Bar Examination, you should read this book.